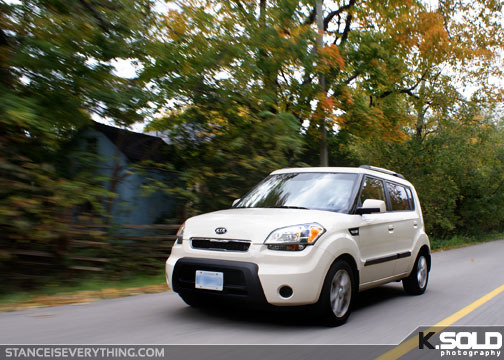 Those of you who pay a lot of attention both here and on twitter might know that my girlfriend drives a Kia Soul 2u (the one without the flashing speakers), she’s had it about a year and it draws a surprising amount of attention for a stock vehicle, a lot of which can be contributed to it’s unique shape on somewhat rarity on the road. However after watching me look at, and write about, cars almost daily for the past year has made her begin to wonder what her car could look like with a bit of a drop and some aftermarket wheels. 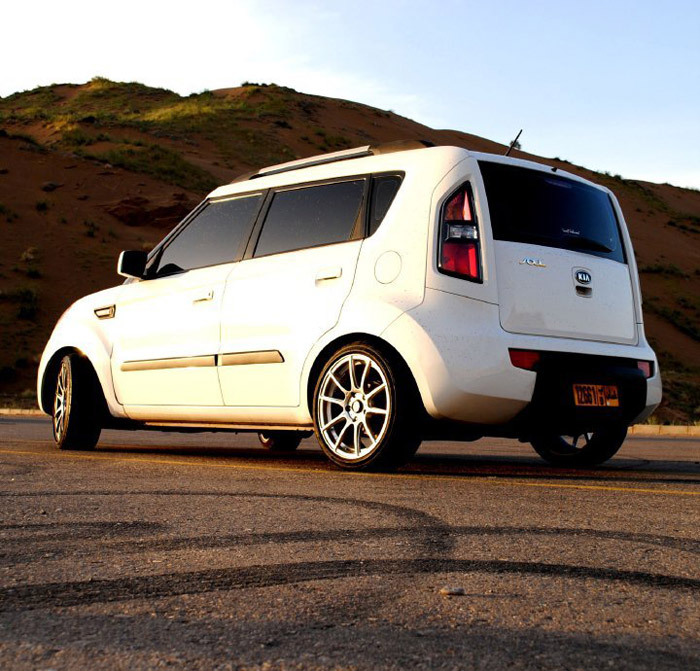 The nail was firmly placed in ‘I will never modify my car‘ coffin when she joined the Kia Soul Forums and found the following car lowered on a set of 17s. 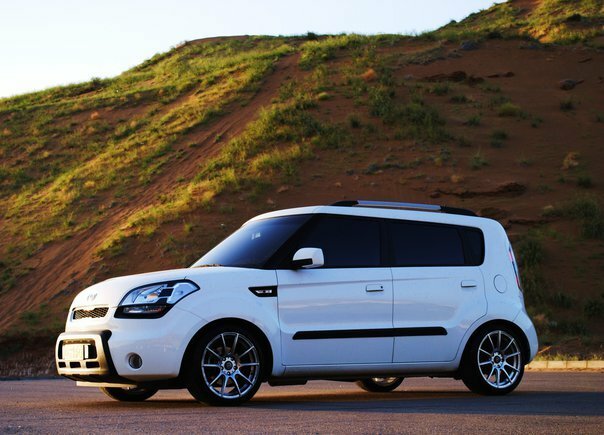 While a lot of Kia Soul owners, for whatever reason, go overboard with decals, spoilers, and aftermarket rims at stock height this owner decided to drop his on a set of wedsports and call it a day. The height looks very livable for the summer and winter and the only downside I see to this setup was that it was achieved via cut springs, however with a little digging I discovered that H&R makes a spring setup for this car. While I don’t see these cars picking up as much of a following as Scions have I’m pretty sure a few more tasteful ones will be popping up on the internet now and again, why not? Ollie we didn’t get Scions either, I think we are getting the 2nd gens but we didn’t get the first as far as I know. She doesn’t have time to watch for potholes. This very car is nice, though nothing special was done to it. I wonder why we don’t see much of those tuned and stanced. When it first appeared on the market I was sure it would repeat the way of xB, but it surprisingly does not! Why?! The car looks fresh, modern and bright! It DOES have good quality and reliablity along with friendly pricing. I hope we at last see some properly done. 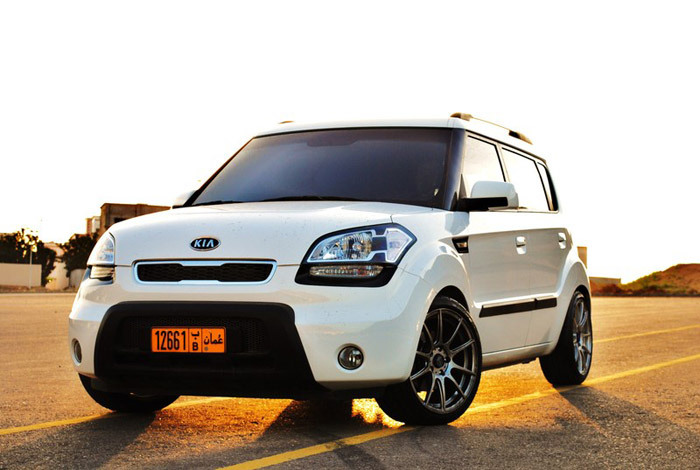 I have a Kia Soul aswell and bought it as my daily but find myself wanting to modify it. but i bought so i wouldnt modify it and could spend more on my modified car. the reason for not many modified ones is theres a very small aftermarket for these. Theres 3 spring suppliers and nothing over 1.5″ and NO coilovers yet. Personally, I’d bag mine with widened steelies and whitewalls, hell id static drop it like that if the went more that 1.5″, but for the time being theres no springs worth it. Oh and no one makes a aftermarket shock yet either. and yes, most modified ones are quite bad, mainly because the people dont really know what they’re doing. But most importantly they love their soul and what they’ve done to them. Glad you stopped by, any new mods? not yet, but, im getting LED tail lights and a simple spoiler, just waiting for a reply so i can order, i live in the middle east. i’m thinking of removing the badge ‘soul’ as suggested , plus i wna paint the black parts white, hesitating while i should do it or not. If i could, i’ll paint the whole thing ‘Pearl mate white’ ouch! xD .